Strongpoint is excited to announce a series of powerful enhancements and new features in our latest product release, Version 5.2. Version 5.2 is now available for your sandbox for pre-release. Since we cannot push updates to your sandboxes, please update the Strongpoint bundle in your sandboxes to ensure you are using the latest version in all accounts. Note that we will be pushing the 5.2 upgrade to your production account during off-peak hours starting on January 26, 2018. This capability enables users to create a single control by combining two saved searches. This functionality is useful when it is difficult, or impossible, to derive all the data that you need from a single search but it is easy to get the data in two separate searches. With this enhancement a control violation will only occur when the data matches both searches. 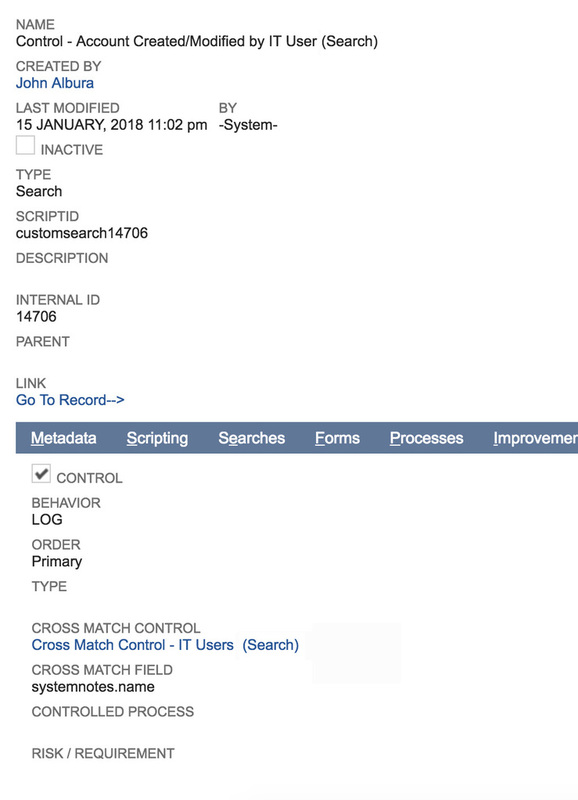 Configured the Controls tab to only produce a violation when the person who changed the fields monitored in Step #1 was also on the list in Step #2. See the a visual of this example below. Strongpoint wishes to extend a special thanks to the team at PWC for helping us work through, and validate, this new functionality. This feature has many other uses that will greatly simplify your life. Our team can help you deploy it; please contact us for assistance. Now users can access a useful library of commonly needed out-of-the-box Financial and Transactional Controls. We are now putting at the fingertips of Auditors and Finance teams a set of controls they frequently need, that can be created in minutes creating significant time savings. System implementers will also save time by easily extending and tailoring these controls, instead of needing to configure controls from scratch. One of the controls available with this release is our new Partner Commissions Created and Approved by the Same User control. This control monitors the account for any Partner Commission records that are created and approved by the same user. Strongpoint extends a special thanks to all of our customers who shared their compliance risk matrices with us, enabling us to define controls for the most common issues. We also thank the teams at Nortek and Ncino for helping us work through and validate these controls. This feature is currently available in beta for customers who wish to use it. If you would like to try this new bundle, please Contact Us and we’ll get your account set up! Strongpoint will continue to enhance this feature based on customer feedback. This latest improvement makes it easier and faster for release engineers to compare very large amounts of objects across 2 environments in complex implementations. This is critical for verifying the completeness of your implementations and large releases, and it is also extremely useful for troubleshooting differences between accounts after launching a large project. It is very common after a large implementation to validate that everything has been moved across from a lower environment (e.g. QA to Production). Now all objects can be compared in the entire account within a single operation including all settings, user roles, customizations and permissions. Custom Record Entry Forms - Strongpoint now treats Custom Record Entry Forms as a separate object, allowing changes to be seen in the change management flow. Set Up Preferences - Strongpoint now includes all Set Up Preferences documentation giving a comprehensive view of each account setting. Strongpoint wishes to acknowledge the NetSuite platform team for the new SuiteScript 2 API, which now allows for support of these objects. Strongpoint is constantly ensuring that we take full advantage of all of NetSuite’s capabilities. With the NetSuite’s recent 2017.2 update we are leveraging NetSuite’s enhanced processing and queue support so that Strongpoint scripts are processed as quickly and efficiently as possible. We now offer a new Entity Relationship Diagram (ERD) that utilizes the “Website is Offline” feature. In the past, there was a dependency to have the website model enabled on NetSuite, however we have removed this dependency. This gives more flexibility as users can now decide to have the website model enabled, not enabled or even non-existent. It is now your decision on how you wish to proceed. Also available now is enhanced indexing and documentation to improve the removal of links that no longer exist within the actual object. Strongpoint will now communicate important announcements to you directly through the application in a popup window. This is a great way for you stay current on what’s new and exciting from Strongpoint, including new product capabilities and training sessions.